EAST LANSING, Mich. (AP) Three Michigan State football players are being charged in an alleged sexual assault on campus in January, an attorney said Monday. Ingham County prosecutor Carol Siemon said only that three people were being charged in the incident, but she didn’t release details or names. Karen Truszkowski, an attorney for the accuser, told The Associated Press that the three are football players. ”I’m pleased to see the process is moving along. This is just one more step along the way,” Truszkowski said. In a separate but related investigation by the university, the three are facing possible discipline as students. Earlier Monday, Michigan State released a report from an external law firm that investigated the football program’s handling of the allegations. The investigation found no evidence that coach Mark Dantonio violated the school’s policy on relationship violence and sexual misconduct. The report said Dantonio ”took prompt and decisive action” with respect to the January incident that has led to criminal charges. The school announced Feb. 9 that three players were suspended as part of a sexual assault investigation. A staff member associated with the football program also was suspended. On Monday, school spokesman Jason Cody confirmed that the staffer in question was Curtis Blackwell. The school said last week that Blackwell’s contract – which was set to expire at the end of May – was not being renewed. Michigan State trustees had a work session Monday, which was not open to reporters. Afterward, Chairman Brian Breslin said the board received a briefing ”on football and athletic activities” from Dantonio and athletic director Mark Hollis. ”While it is not the practice of the board to make a statement after a work session, given the rumors that have been swirling in the media over the weekend, we, the board, state that President (Lou Anna) Simon, athletic director Hollis and coach Dantonio have the full support of this board,” Breslin said. Around the same time Breslin was talking to reporters, the school released the report from Jones Day, the law firm Michigan State retained to investigate independently whether football staffers complied with university policy in connection with the sexual assault allegations. Simon said the Jones Day report was reviewed at the work session. ”The report, when you read it, will indicate that coach Dantonio and his team, particularly coach Dantonio, handled this in the utmost manner, with integrity and with swiftness, and consistent with the policy,” Simon said. ”The reporting player did not provide details of what occurred, when it occurred, where it occurred, or who was involved. 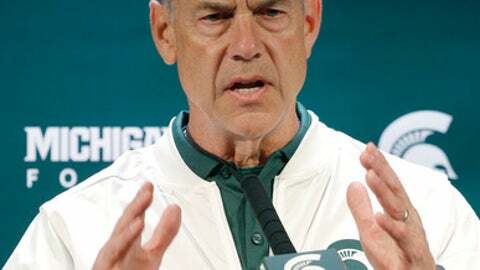 He also did not inform Dantonio that the situation involved sexual misconduct or assault,” the report said. ”The reporting player informed the staff member that he had already spoken with Dantonio and that Dantonio was reporting the information to OIE,” the report said.